A group of milk-cow owners in Hixon is fighting Northern Health for the right to consume the milk they produce, despite it being unpasteurized. Lesley McConnachie, owner of Hunny Do Ranch, where the milking cows are kept and cared for said, "Northern Health has ordered the members of the group to cease and desist the practice of packaging and distributing the raw milk to the members." McConnachie has letters from George Abbot, when he was minister of health services, and an official in the Attorney General's department, saying the province's Milk Industry Act does not prevent consumption of milk by owners of cows, or anyone who has direct care and control of a milk cow. "When we showed the letters to Northern Health, they just said "Those people are not our boss." "In the two years we've been doing this, no one (in the co-operative) has become sick, and besides that, it's not exactly a spreadable disease," said McConnachie, who sees Northern Health officials "as big bullies". Gred Thibault, NH manager of public health protection, showed much concern for the Hixon people who are consuming raw milk. "We know the risk of unpasteurized milk to contain illness-casuing bacteria is very high," said Thibault, citing food poisoning and salmonella as common illnesses caused by raw milk. "In farm-animal environment, you'll also find ecoli, parasites and crytoporidium that cause people to become very ill, ususally with cramps and diarrhea," said Thibault, adding those who seem to at most risk are young children, pregnant women and people with compromised immune systems. "It's true that not every squirt of milk will be contaminated, but as a health inspector for 24 years, I can pretty well guarantee if you go from drinking store-bought milk to raw farm milk, you will become severely ill within a month to three months. "I've got the follow-up data from my field experience that shows individuals drinking raw milk will become sick. "They may call it the flu or something else, but I've been able to trace it back in many, many cases to unpasteurized milk. Recognizing the problem, in the early '90s the federal goverment brought in legislation requiring pasteurization of all milk products." He added that "studies show there is no added benefit for pasteurized or unpasteurized milk, but the potential for illness is greatly increased with unpasteurized milk." He says the Hixon group is good at creating loopholes to continue marketing milk products like butter, and suffice to say that an inspection visit to the ranch milking barn did not score well with NH environment officials. McConnachie is baffled why the officials care if members consume milk from their own cows. "It's pretty well known that people consume what they want - alcohol, tobacco, raw sushi, spinach - and nobody says a word about that. I just want Northern Health to leave our members alone," said McConnachie. "This all started with one cow, and it just grew from there. 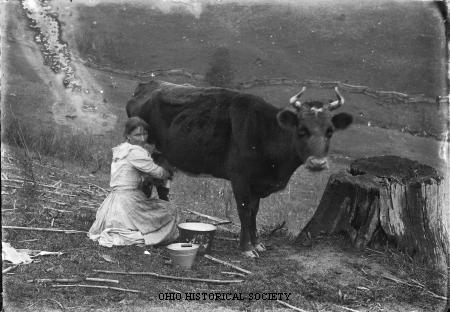 Today we have eight milking cows," said McConnachie who provides the pasture for grazing, and is ultimately responsible for the milking, distribution and daily care of the animals. But the share mambers are in contact with the ranch and their own cows, often helping with the feeding, watering and the clean up, said McConnachie. First off I want to say that we are not part of the Hunny Do Ranch cowshare members, nor do we currently drink raw milk, though we did investigate the program about a year ago and completely agree with the health benefits of drinking raw milk.. Both husband and I grew up in environments in which we did drink raw cow or goats milk at various times during our childhood and teenage years. We as individuals need to begin thinking for ourselves, and not believe everything presented by the various milk marketing boards and milk producer associations (remember this is a business and no one wants to lose potential revenue). They are taking away our individual choices and freedoms by outlawing the sale of raw milk. Milk has been drunk by humans for millennia and I fail to believe that it is unhealthy unless pasteurized (pasteurization has only been around since 1864 so isn't is amazing that the human animal is still alive considering raw milk has been drunk for centuries before this discovery?). This is a natural food which is illegal in Canada and many other countries, yet the governments condone 'fake' foods full of chemicals, fillers, flavourings, colourings, preservatives etc. It just doesn't make sense to me. I also have to wonder why Northern Health is all of a sudden so concerned about a few people in the area drinking raw milk, when the general public purchases and consumes a variety or products from grocery stores that have been recalled by the Canadian Food Inspection Agency, yet unless you actually go onto their website the public usually doesn't hear about the recalls. Perhaps Northern Health should put their efforts into warning the general population at large about foods that could be harmful to those that unknowingly purchase those products. I personally believe that raw milk is very healthy due to the enzymes and healthy bacteria that are present and not destroyed by pasteurization. We live in a society in which everything is so sanitized and sterilized that our bodies can no longer cope with, and fight off various diseases... eat a little dirt - its good for you ;) I feel this is why, according to the above article, the inspector is finding that some people become ill after consuming raw milk - they are getting diarrhea because their bodies are not accustomed to to the various enzymes/good bacterias that humans should be ingesting. Obviously milk must be gathered and produced in a clean environment from cows and goats that have been kept in good conditions with proper nutrition so as not to be contaminated by e-coli or bad bacterias. I noticed one glaring mistake in the article as follows "the federal government brought in legislation requiring pasteurization of all milk products". This is not true, as in Canada we are able to produce and purchase raw milk cheeses. From the Health Canada website: "Raw milk cheese is made from raw milk. While raw milk is not allowed to be sold in Canada, raw milk cheese is allowed for sale. This is because the way raw milk cheeses are manufactured and produced helps eliminate any harmful bacteria that may be present in raw milk. " The article in the newspaper has really infuriated me, and husband and I have been discussing writing a letter to the editor in support of the cowshare program and Hunny Do Ranch. I am going to investigate the feasibility of obtaining a cow for milk and see if the cost and time involved would be something that we could handle. Perhaps Northern Health has pushed us into it... let them try to ban me from drinking milk from our own cow! For more information about raw milk and to make your own informed decisions, you can google 'raw milk' and come up with various websites with pros and cons.